Mini-Windows. For less than 200 Euros (~$223) you can already get an 8-inch tablet with genuine Windows - although it is only the 32-bit version. 169 Euros (~$189) for the Lenovo Miix 3 8 is quite a challenge to the competition. What can be expected for such a price? Windows 8 has long been established among tablets. Android and iOS are no longer without any alternatives in this appliance class. This means that the diversity of software, that is common in computers and laptops, can also be used on tablets. It probably goes without saying that a tablet for less than 200 Euros (~$223) cannot cater to any special needs regarding performance or connectivity. The Atom processor is designed for low power usage - not for performance peaks. Its purpose is to give desktop applications that require only little power, as much runtime as possible. Thus, the power consumption is only a few watts. About one and a half years ago, we extensively tested the predecessor, the Lenovo Miix 2 8. Usually you expect an advancement from a successor, for example more power or more features. This is not exactly the case this time: For instance, the resolution has reduced from HD-ready to 1024x786 pixels, the battery offers only 15 Wh instead of 17 Wh and the Windows Home button has disappeared. Are these downgrades sensible? Everything is put into perspective once we have compared prices: The predecessor used to cost 300 Euros (~$335) - this is more than 43% above the price of the tested budget model. 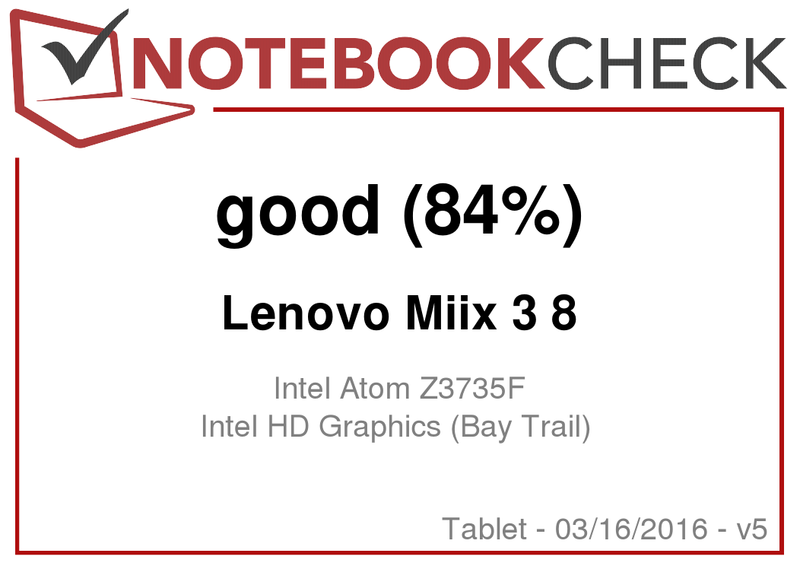 The gap with the Miix 2 8 is filled by the current Lenovo Yoga Tablet 2 8, which comes with an identical Atom processor, but also with Full HD resolution and luxurious connectivity. However, Asus' or Dell's product range also include Windows tablets for less than 200 Euros (~$223), for example the Asus VivoTab 8 or the Dell Venue 8 Pro. Given the price, we would not have complained about a plain and cheap plastic case. 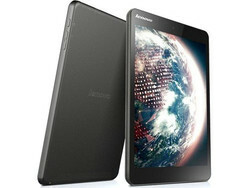 However, Lenovo has provided the tablet with a matt aluminum backing, which gives it a pleasant and sturdy look and feel. The metal case is indeed quite sturdy and robust. Hence, it exceeds all expectations for a case of a low-priced tablet. The connectivity, on the other hand, is sparse and offers no more than the bare minimum for a tablet: Besides a power button, volume rocker, headphone jack, MicroUSB port and MicroSD card slot the Miix has nothing more to offer. Even the Windows Home button has disappeared - as it is also the case for the above-mentioned competitors by Asus and Dell. Concerning the internal components, they are just as unimpressive as the exterior ones and simply match the price: WLAN is available in the standards 802.11 a/b/g/n and Bluetooth comes with the current version 4.0. The 2 MP webcams on the front and back could be used for video telephony at best. The touchscreen supports input of up to ten fingers. Although rarely more than two - or even three - fingers are used, it is still unusual for this price range to include such a multi-touch display. 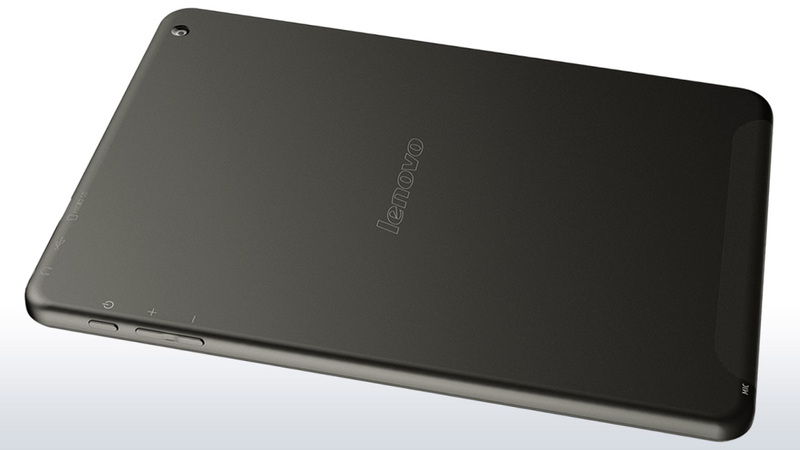 Lenovo's better model, the Yoga Tablet 2 8, accepts no more than up to five fingers simultaneously. Nevertheless, this is no real drawback. Controlling Windows 8 with your fingers works flawlessly and intuitively on the Miix. Common multi-touch gestures are executed instantaneously. Other input devices such as the mouse or keyboard can be coupled wirelessly via Bluetooth. 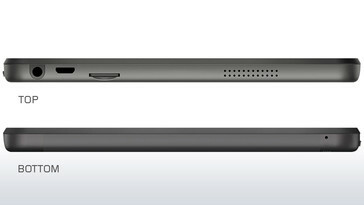 Lenovo has dispensed with a stylus for the Miix. However, Dell proves that this does not have to be missing in low-priced 8-inch tablets with the Venue 8 Pro. Admittedly, the Dell tablet costs almost 100 Euros (~$112) more. A resolution of 1024x768 pixels is associated more with outdated CRT displays. Lenovo relies on the 4:3 format this time, while all other tablets with 8 inches offer at least 1280x800 pixels in the 16:10 format - even the predecessor, the Miix 2 8 used this resolution. The same goes for the measured brightness. With a value of slightly below 300 cd/m² the Miix lags behind in comparison to its predecessor and the competition. The average brightness is a meager 289 cd/m², which makes the device only just sufficient for outdoor use. This would not be the case if the display was marginally darker. 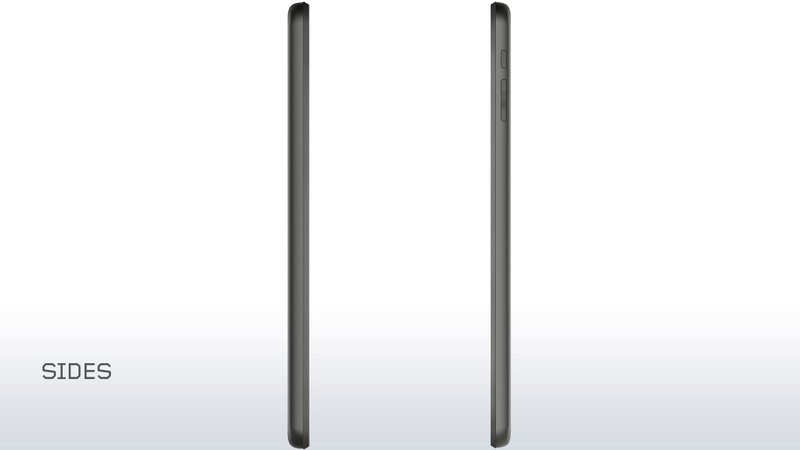 After all, the IPS display is known for its viewing angle stability. The measurement of the color fidelity via CalMAN reveals significant deviations of the colors blue and magenta. Like many of the inexpensive displays, the Miix has a blue cast. However, it should only be noticeable to the user when being compared to a well-calibrated display. The tablet's power is sufficient for simple desktop applications. Whether office tasks or browsing the web - the Atom processor indicates no performance losses at all. The 2 GB of main memory as well as the 32 GB of mass memory of the eMMC module are also impressive. Currently it would be foolish to expect more from an 8-inch tablet in this price range. Even the more expensive competition is not necessarily equipped with much more powerful hardware. On the contrary: The similarly priced Asus VivoTab 8 offers only 1 GB of RAM, which is somewhat meager even for a budget tablet. Just like many other low-cost Windows tablets, the Miix comes with an Intel Atom processor, the Intel Atom Z3735F. This is a frugal quad-core SoC with a base speed of more than 1.3 GHz that can reach up to 1.8 GHz under load. While idling, the speed is limited to about 500 MHz. Comparing the Cinebench results shows that even more expensive 8-inch tablets with slightly better Atom CPUs cannot offer much higher processor power. In the Single-thread benchmark, the differences are in the single-digit percentage range. 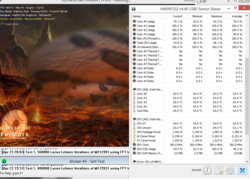 Furthermore, even in the benchmarks with multi cores, the gap is never larger than 15%. Probably other aspects of the equipment are accountable for the difference in price. As mentioned before, the hardware satisfies the needs of the end user. PCMark 7's benchmark result of the overall performance proves that there are hardly any performance gaps between the Miix and its competition. This comes as no surprise since all models are equipped with a 32 GB eMMC flash memory and 2 GB of main memory. As already mentioned, the Asus VivoTab 8 is the only one with a poor 1 GB of RAM. Unfortunately, since we do not have a PCMark 7 benchmark result for this tablet, we cannot use it for comparison. An eMMC module with a capacity of 32 GB serves as storage. The Lenovo Miix 3 8 uses Samsung's MBG4GC model. When compared to its competitors, the read and write speeds of the flash memory are average. That an Intel Atom does not offer any graphics performance was obvious from the outset. The internal graphics unit of the chip, the Intel HD Graphics (Bay Trail), can only satisfy low expectations - such as smoothly displaying YouTube clips in Full HD. You should not even consider tasks such as elaborate 3D rendering or hitch-free video editing. This is not the purpose of tablets anyway - especially not in this price range. Comparing the 3D Mark benchmark results reveals the same as the previous benchmarks: The performance gaps compared to other tablets with Atom processor (and same graphics unit) is negligibly small. Although in principle Windows games can be installed on the tablet, the hardware as well as the missing mouse and keyboard considerably diminish the gaming experience. This tablet with its graphics unit is anything but ready for games. The measured fps values of several games, which can be seen in the section of the graphics unit, are more than enough proof of that. Nevertheless, we have done one more test for all those that want to try it out with Bluetooth keyboard and mouse. “StarCraft 2” offers the native resolution of the tablet. The five-year old strategy classic can be played quite well with low details at around 40 to 50 fps. The small power dissipation of the frugal Intel Atom allows passive cooling. Therefore, the tablet does not contain any components that might make noises and the tablet is pleasantly silent. Just like in our laptop tests, we conduct the same prime95 and FurMark stress tests with Windows tablets. Under full load, the Atom processor initially runs at maximum speed, which is about 1.6 GHz. However, after a few minutes the case temperature rises, which is especially noticeable on the aluminum back and the clock speed does not exceed the base value of 1.3 GHz. In practice, it should be rare that the hardware is pushed to its limits. In this case the tablet gets noticeably, but not unpleasantly warm. Under maximum load we have measured temperatures of up to 37 degrees (~99 °F), which is still comfortable. (±) The average temperature for the upper side under maximal load is 32.8 °C / 91 F, compared to the average of 30.7 °C / 87 F for the devices in the class Tablet. The speakers of the Lenovo Miix 3 8 produce an audible and clear sound. Extensive demands should not be expected from a tablet with a price tag of 169 Euros (~$189) and a mono speaker. The sound is thin and comes from one side of the device. Although short videos or calls are still bearable, it is recommended to connect external speakers or headphones for long movies. Thanks to the modest Intel Atom, the power consumption of the tablet is relatively low. While idling, it needs less than 1 watt. The Asus VivoTab 8 requires up to 2.4 watts - the Lenovo Yoga 2 8 up to 3.4 watts. Under load, however, the Miix 3 8 consumes up to 10.9 watts, which is on par with the competitors. We determined the battery runtime with the practical WLAN test and the Battery Eater tool. The Miix 3 8 lasts almost 6 hours without power supply. As mentioned at the beginning of the review, the battery of 15 Wh is somewhat smaller than that of the predecessor, which had a capacity of 17 Wh, and therefore ran slightly longer in the WLAN test. 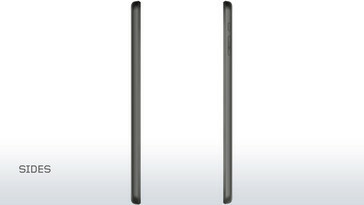 By contrast, the Asus VivoTab 8 equipped with an identically sized battery, achieves a runtime of slightly more than 5 hours. The 18 Wh battery of the Dell Venue 8 Pro lasts just slightly more than 6 hours. The same goes for the Lenovo Yoga Tablet 2 8 with an even larger battery. A Windows tablet for only 169 Euros (~$189) - can anyone expect anything useful for that kind of money? Yes, Lenovo has herewith proved it. The benchmarks confirmed that the computational power does not decrease proportionally to the price when compared to more expensive competitors with Atom processors. On the contrary, the Lenovo Miix 3 8 is in no way inferior to the 8-inch tablets priced at 300 Euros (~$335). Nevertheless, you need to compromise for such a price. Although the display in the 4:3 format is not necessarily a drawback, the low resolution of 1024x768 pixels is. Most 8-inch tablets already come in HD-ready format. The screen's brightness could also be better for a tablet. Nonetheless, the Miix is no junk: It is quite delightful that Lenovo has equipped such a low-priced tablet with an aluminum case. Not only does this improve the device's value, but also its robustness. It should also be mentioned that the tablet does not display any deficiencies or major drawbacks that ought to be expected for such a low price. This is an advantage in itself. Thus, with the Miix 3 8, Lenovo offers a quite good price/performance ratio for an 8-inch tablet.